It's been just a handful of days since the hashtag went viral across social media, and Facebook reports almost half their users know someone who shared a #MeToo story about sexual harassment. FCC Disclaimer: While we were compensated for the time it took to tell you about Purina's partnership with the Urban Resource Institute, the fee did not influence our opinion in any way. We fully endorse the URIPALS initiative and believe this content to be relevant to our readers. All sponsored posts will always reflect our honest and unbiased opinions. The opinions stated here are our own. There are more than 1 billion people active on Facebook. That's almost 500 million people who know someone who has been harassed, possibly abused. Let me introduce you to another number. 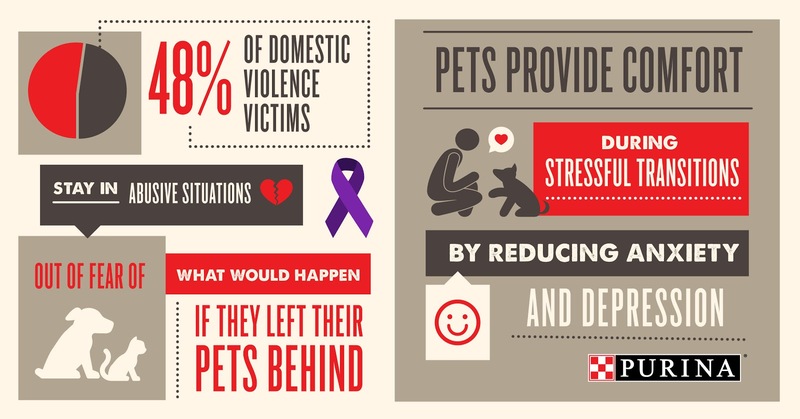 Did you know that 48% of domestic violence victims stay in abusive relationships out of fear of what would happen if they left their pets behind? I've been there. I know the feeling. I recall sitting at the top of the stairs, hearing gunshots being fired into a basement wall, knowing that I could not escape my situation ... and leave my cat behind. I have no doubt my cat would not have survived. That was a lifetime (and a previous marriage) ago. I'm one of the lucky ones: I had a support structure, friends who took me - and my cat - in. My cat and I went on to forge a life on our own, and then we met the wonderful man I'm now married to, the cat dad to Maxwell, Faraday & Allie. There are many, many people who aren't so fortunate. October is Domestic Violence Awareness Month, and it's the perfect time for us to deepen our understanding of these issues, and share resources with those who might benefit from them. One such resource is the Urban Resource Institute. 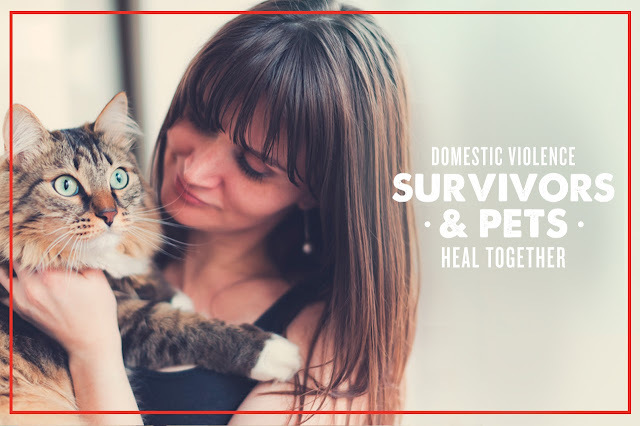 The Urban Resource Institute in New York is one of the very few domestic violence shelters in the United States that is able to accommodate victims and their pets. Several years ago, Purina partnered with URI and its People and Animals Living Safely (URIPALS) program. By supporting the PALS initiative, Purina is helping to make it possible for URI to expand. One of URI's stated expansion goals includes publishing a manual to educate domestic violence agencies. It's the Urban Resource Institute's hope that shelters everywhere will follow URI's example and create their own programs like URIPALS, so that fewer families will be forced to choose between their pet’s safety and their own. We're lucky in Kansas City - one of our shelters, the Rose Brooks Center, has done exactly that: they built an in-house pet shelter so abused families seeking shelter aren't separated from their pets. Purina has created this infographic you can print, email, and share with others to help spread awareness of this need. If you know of an agency in your area that has not yet implemented a plan that includes victims' pets, please share it with them. 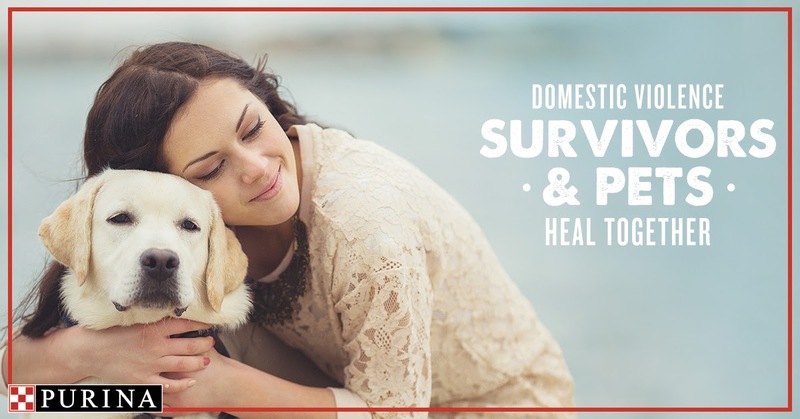 Let them know that survivors of domestic violence should be able to shelter together with their pets in a safe place as they recover and heal. for support at 1-800-799-SAFE (7233). Wonderful post! I never would've guessed your history - but that's part of the problem, isn't it? So much shame ... fear ... other people never able to guess our darkest secrets that we protect so carefully. I admire you for being so candid about your own experiences. There's so much shame - especially for independent, smart, and strong women like us. I'm glad you found your [much-deserved] happily ever after. I can't imagine any better message of hope to those stuck in these types of situations now. Have NO idea why they showed up here today! Blogger got a case of the hiccups and scrambled them?? Wow! I am grateful you were able to escape that terrible situation and move forward. So often we are brainwashed into thinking things "aren't that bad" and it will be okay. Many stories are out there about pets who were killed during violent outbursts as a way of controlling or punishing the victim. Thank you for sharing your story. Hearing what you went through makes my heart stop. I'm so, so happy you were able to find a way out and find the wonderful life you so deserve. Excellent post, thank you for sharing your story. I am sorry you had to go through that, but glad you came out of it and found true love. I think shelters for people with pets who are escaping domestic abuse is critical and a worthy cause to support. Thanks for sharing your story. Shelters for women that include a place for pets is SO important... but you know that from experience. I hope that there are lots more of them in the future. There are few things as insidious at domestic violence - and its not confined to one social class either. In the UK the worst offenders are those with plenty of money (weird). It is vital safe havens are provided for women at times like this! Their lives are a nightmare every day. We are so grateful that you were able to survive that horrible situation. Thank you ofr speaking out, and for sharing this special initiative by Purina. We need lots more shelters for women who have pets to be able to escape their abusers. Thank you for sharing your story. We are so so sorry that you were in a very bad situation and relieved that you managed to get out with your cat. It is good to know about shelters with associated shelters for the animals. Considering also how damaging it is for children to hear parents fighting, no doubt it is also traumatizing for the pets. We had no idea and are so glad you had a support system to keep you both safe. Our local humane society has a safe haven program to help victims of domestic violence. You are brave to share that with us...and I am glad you had a truly happy outcome. Support is such a backbone to success and relief from evil things. Purring and pawyering for others who are still in abusive situations.